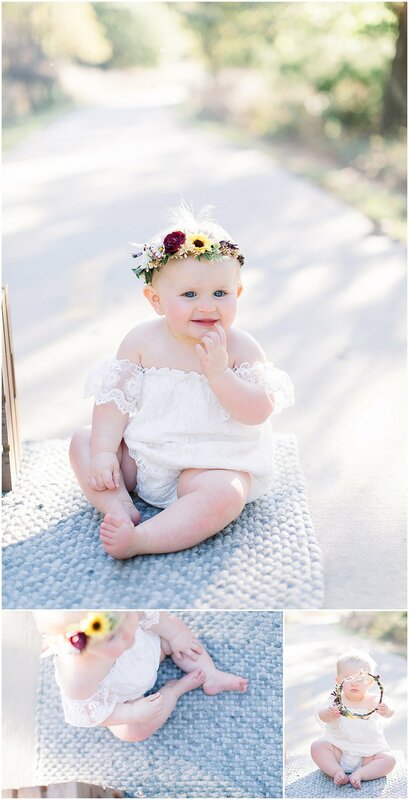 I have been waiting for a solid nap when I don’t want to sleep to share this magical one year old photo session. Way back in the fall when I was passing through Oklahoma a dear friend was also in town and asked me to take one year photos of her daughter. The weather was fantastic in November for a Golden hour milk bath photo session! Lindsey was extremely thoughtful choosing the details of Whitley’s photo session. There is beautiful meaning behind every detail of this shoot. The most meaningful are those sunflowers you see. Lindsey’s brother unexpectedly passed away over the summer and those bright yellow sunflowers embody everything about her brother. And so of course Whitley honored her uncle by dawning beautiful sunflowers in her hair and in the bath!